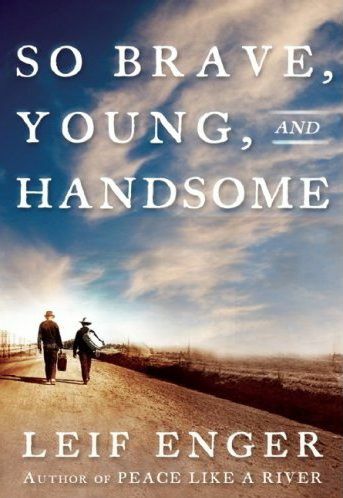 I’ve chosen Leif Enger’s new book, So Brave, Young, and Handsome, for my summer book giveaway. I adored his first novel, Peace Like a River, and I just finished his second book last week. While the two story’s are quite different, Peace Like a River explores family and faith while his new book is a western saga of adventure and redemption, they are both written with a leisurely, poetic prose that often had me re-reading sentences for the simple joy of it. If you’d like to get your hands on a new hardcover copy of So Brave, Young, and Handsome, leave a comment on this post and I’ll pick a random winner next week. Good luck! This entry was posted in Books and tagged books, contests, giveaway, Reading, reviews by Lilli Day aka bookbabie. Bookmark the permalink. Sounds like a great book! I’d love to be entered. Thanks for the chance. I’d like to enter. I also loved Peace Like a River, I’m in! Well I have to enter, since I was the follow-up recipient of your last book give away. The book sounds interesting. Include me in. Thanks for all your interesting posts. Sounds like a good book ~ please include my name in your drawing. Thanks! I don’t read a lot of fiction but I’d like to give Enger a try, especially if it’s free! Ooh, catching up on blog reading just in time! 😉 Hope everything is well with you and your family. Haven’t come across this author before, love to try him. Oh! How fabulous! I am always looking for great new books to read! ENter me–I would love to win this book!